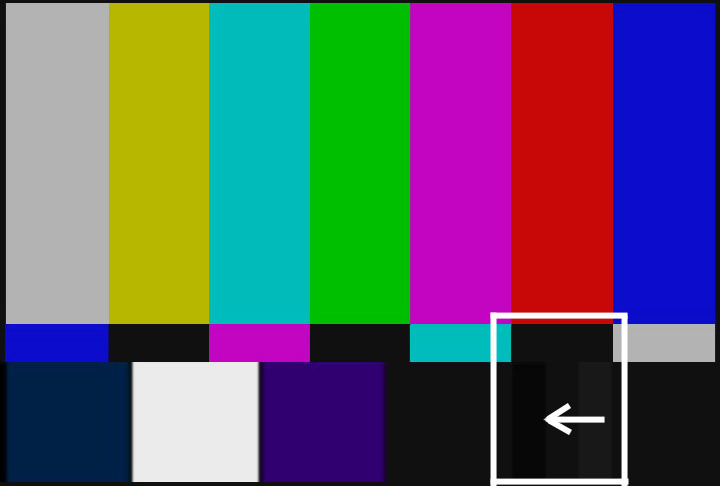 Assuming your broadcast monitor has already been properly white & black balanced (usually an internal adjustment requiring a technician), warm the monitor up for 20 or 30 minutes. Directly feed the NTSC SMPTE bars out of your non-linear editing system (or any other quality SMPTE signal generator, but don't use this jpeg picture above as a calibration source) into the monitor & make sure it is properly terminated (do not loop through anything else). Push the "Blue" button (not the one that cuts off the blue gun) & you should now see either a blue & black, or a white & black SMPTE pattern (depending on which model your monitor is). Now adjust the HUE (also known as Phase or Tint) so the 3 tall dark large color bars are the same shade (sometimes it is necessary to adjust the brightness to see this more easily). Now adjust the COLOR SATURATION (also known as Color or Chroma), so that the short color bar underneath each tall color bar is as close as possible in shade (notice that this applies to light & dark bars). The HUE & COLOR SATURATION controls affect each other, so you should now refine the settings by going back & forth from Hue to Color until you've gotten it as refined as you can. Hint, often it is easier to see subtle hue changes between the tall & short light bars. Turn the "Blue" button off. If you cannot get your monitor even close, chances are it needs a black & white balance calibration by a technician, or the color temperature is significantly off 6500 degrees Kelvin. Next, adjust your BRIGHTNESS control (also known as Pedestal or Set-up) while looking at the 3 small vertical black bars directly under the red bar . You should adjust the brightness so you can almost not see any difference between the left hand black bar & the middle black bar (see white arrow I drew) (NTSC monitors only). The room lighting will affect your perception of this setting, so you may have to adjust the brightness again if the room lighting changes. Lastly, adjust the CONTRAST control (sometimes known as Picture or Video), to suit your taste (you may need to also view picture material to determine this). Often the best position for the CONTRAST control is about the middle setting. There is nothing in the SMPTE test signal to calibrate a monitor for contrast, but don't make it too contrasty or it may appear to bloom in bright areas. The BRIGHTNESS & CONTRAST controls affect each other, so once you have the contrast control where you want it, adjust the brightness one more time until you can hardly see any difference between the left & middle vertical black patches on the SMPTE bars (NTSC monitors only). Your broadcast monitor should now be calibrated. If you are happy with these settings, take a bottle of paper whiteout (Liquid Paper) & mark the mechanical controls so you can easily bring them back to the right spot if they get tampered with, or write down the settings for future reference if they are menu driven. Remember that you will regularly have to adjust the BRIGHTNESS control depending on the ambient room lighting & how warmed up your monitor is, so keep that SMPTE signal handy, or use the setup button for black level reference if your monitor has one. If you don't have a broadcast monitor with the blue gun control, there is a way to calibrate a regular television monitor using the SMPTE test pattern & a proper blue filter. Try a Kodak Wratten Blue 47B Gelatin filter, or Lee Colortran Inc Congo Blue #181 Filter, or Rosco's #80 Primary blue.